I just learned of your unfortunate decision to sign onto the brief for members of Congress as amici curiae in support of the big emitters seeking to strike down America's Clean Power Plan--the first ever national limits on the single largest source of carbon pollution in our nation. You submitted this brief to the U.S. Court of Appeals for the D.C. Circuit Court at the same time a major new study documents that the pace and scope of Sea Level rise is unprecedented. 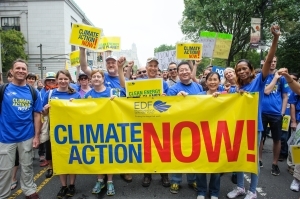 We need climate action, not obstructionism, for our security, economy, and public health. According to a recent poll, two-thirds of Coloradans support the EPA's Clean Power Plan. And this summer, 43 companies with a significant presence in Colorado signed onto a letter to Gov. Hickenlooper calling for the Plan's implementation, saying their support "is firmly grounded in economic reality." America's Clean Power Plan rests on a strong legal foundation, as states, power companies, legal experts and air pollution control officials nationwide have already recognized. In fact, when it has closely reviewed these legal questions on the merits, the Supreme Court itself has repeatedly upheld EPA's authority and responsibility to limit climate pollution under the Clean Air Act--and found that the very authority EPA is relying on here "speaks directly" to the carbon pollution from existing power plants. The carbon pollution reductions outlined in the Plan are expected to: * Save 3,600 lives each year, * Prevent 90,000 childhood asthma attacks every year, and * Save the average American family almost $85 on annual energy bills. Obstructionism and delay are not what I expect of my leaders. Now is the time to accelerate our state's transition to a low-carbon, clean energy future. I support America's Clean Power Plan, and want it to move forward because it has the facts, law and science on its side. In the future, please stand in favor of climate action and our nation's security, and against any further attempts to block implementation of America's Clean Power Plan.